The Kirkpatrick Family Fund has awarded OKC Metro Alliance, Inc. $10,000 for a nutrition program to improve the health and wellness of program participants. 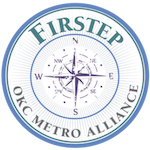 OKC Metro Alliance operates the Firstep men’s and women’s residential recovery programs near Lake Stanley Draper. About 11,000 meals are prepared and served each month. The project will teach food preparation skills and menu planning to help improve diet and nutrition. Firstep is a six-month voluntary recovery program with a work training component. Residents are not charged fees. Women interested in participating in the program can call 794-2834; men can call 799-7540.